So we here at MacUpgrades see about 20 of the MacBook Pro 2011 15” and 17” each and every week with the common GPU failure. These issues occur due to a manufacturing defect within the GPU chips themselves. 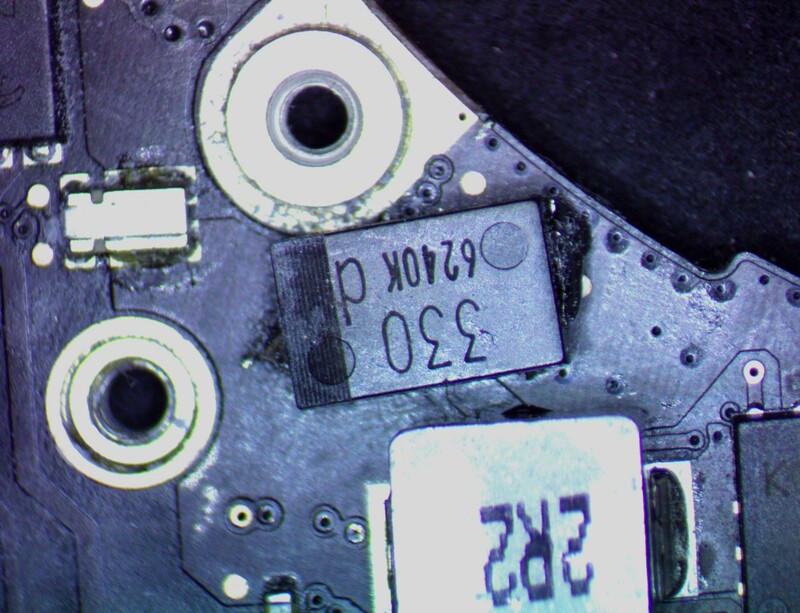 Apple did eventually offer a ERA on this defect but only replaced failed boards with working ones with the same chipset. These units are all now beginning to fail as well. 1. 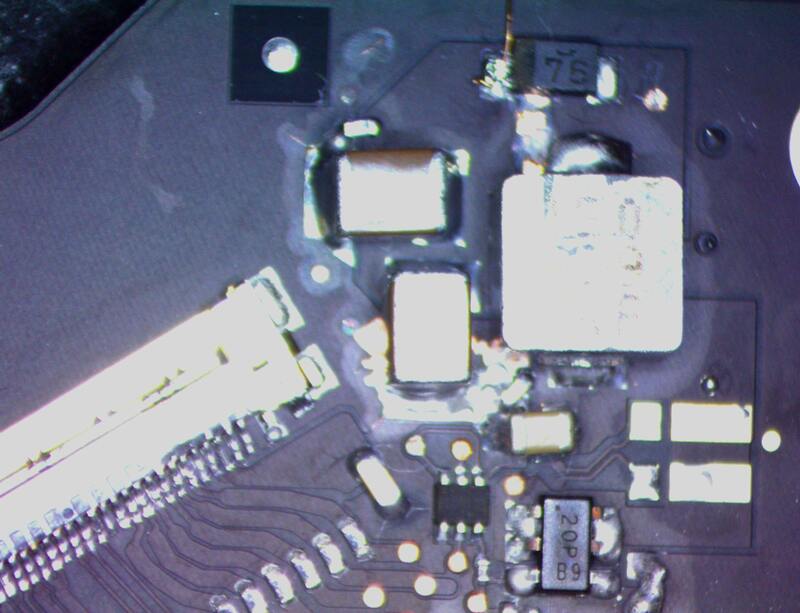 Reflow – A solution we have offered for many years. We remove the board, heat up the chip on a profile which will bring the machine back to life for a few months (some have lasted many years, but this is rare) Machine is fully functional at this time. 2. Replace the GPU – Not an option, simply because no good cards are made and as the fault is a manufacturing defect it will not last. There still are people selling this service for about £300 – it is not worth it. We see so many that have been replaced and its always the same fault. If you were lucky and didn’t get a pre reflowed chip, or a fake its still going to fail. 3. Reball the GPU – Worst option of the lot, costs more than a reflow and is yet the same thing. The fault is inside the GPU changing the balls does nothing other than incidentally reflowing the GPU whilst you are doing it. This works pretty well. Does have full brightness control due to the mux being fully working. It can however fail if you do a NVRAM / PRAM reset and it OS upgrades may cause it to fail, which requires reapplying the fix. If you fancy doing it yourself here is the solution. Please read the whole post before starting. This involves soldering microwires to the GMUX chip so that the dedicated Nvidia GPU is permanently disabled. 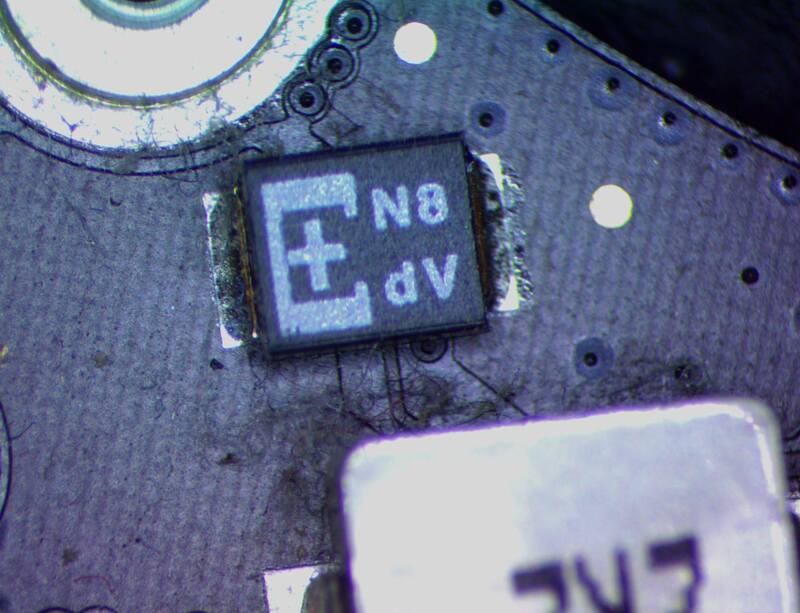 Correctly carried out this repair is permanent, cannot be overwritten with PRAM / NVRAM resets and is a good tested fix. Never worry about software updates or PRAM resets. No software to install or update. No brightness control by default. The GMUX chip is responsible for brightness on the machine so bypassing the chip will result in the machines brightness being 100% all the time. Intensive tasks such as rendering will be considerably slower due to the absence of the chip. We have performed this procedure on a number of machines with completely dead GPU’s and machines which have failed for reflow and even machines with burnt and deformed GPU’s. All work flawlessly. See the link below for before / after shots. After serious testing as outlined above we have decided to offer this as a professional service. Costs for the service are £200 + Vat as it is a long fiddly job. But we feel that for those who wish to continue to use their 2011 MBP it is a good option for continued longevity. 6. Another recent development by CMIZAPPER.com (Firmware Bypass) 15” and 17”. This method is essentially a combination of part of the NVRAM solution and a hardware fix with a chip which ensures that the NVRAM solution is never overwritten. This involves soldering a chip around the Bios / EFI chip on the motherboard. This makes the machine think it is a 13” MacBook Pro with only one GPU (the intel one). This fix is NVRAM stable, so that once the chip is soldered in the fix will not be erased buy an NVRAM or PRAM reset or when doing an OS upgrade. Cheaper than the GMUX bypass. No brightness control by default. Intensive tasks such as rendering will be considerably slower due to the absence of the chip. However if you are doing video editing you should have moved to a newer machine some years ago. Costs to do this are £130 + Vat which includes parts and labour. We hope that this gives you an idea of the options and how we can help. 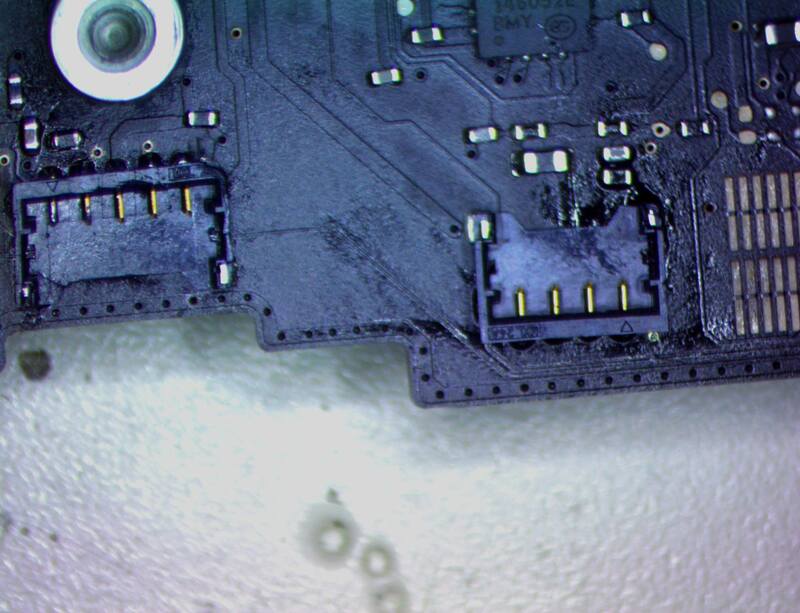 So we have been offering micro soldering to repair many common issues on MacBook Pro logic boards for a while now and thought we’d update you with some common issues we have seen and how we have fixed them! We’ve now saved over 200 machines from the scrapyard or from a £600 apple board replacement. Maybe we can help you? 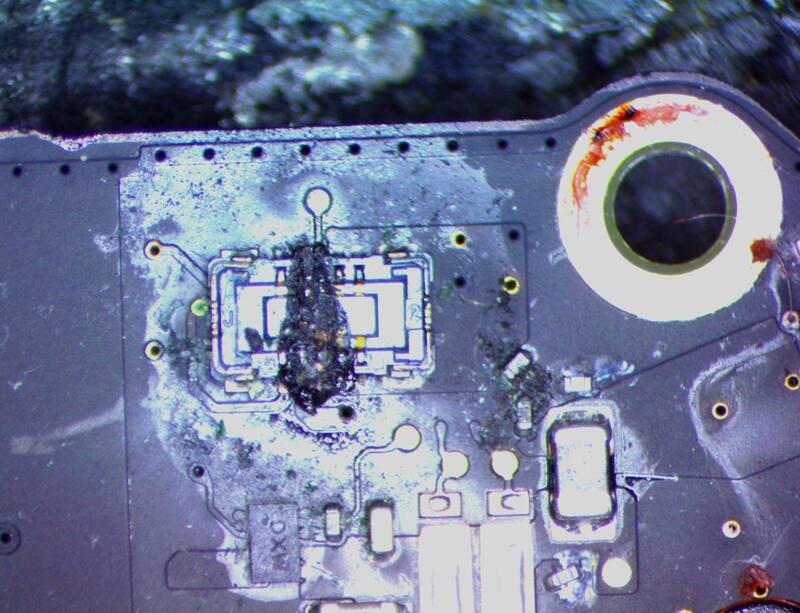 i) MacBook Retina 2013-2015 liquid damage and won’t power on! 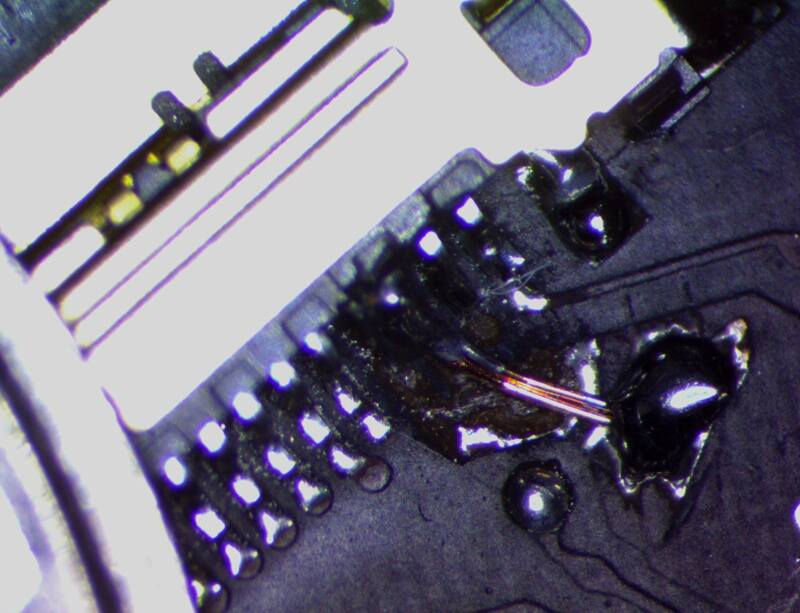 Liquid spills can damage machines in a variety of ways but one we have seen a number of is on MacBook Retina 2013-15 machines where the liquid has shorted the keyboard backlight socket on the motherboard shorting an important 5v rail to ground. As long as there is no damage elsewhere the port can be replaced or removed and it will bring the machine back to life. (ultrasonic cleaning etc is required after and thorough testing). This lets the Mac startup – unfortunately it does stop the keyboard back light from working; but much cheaper than a whole logic board replacement. 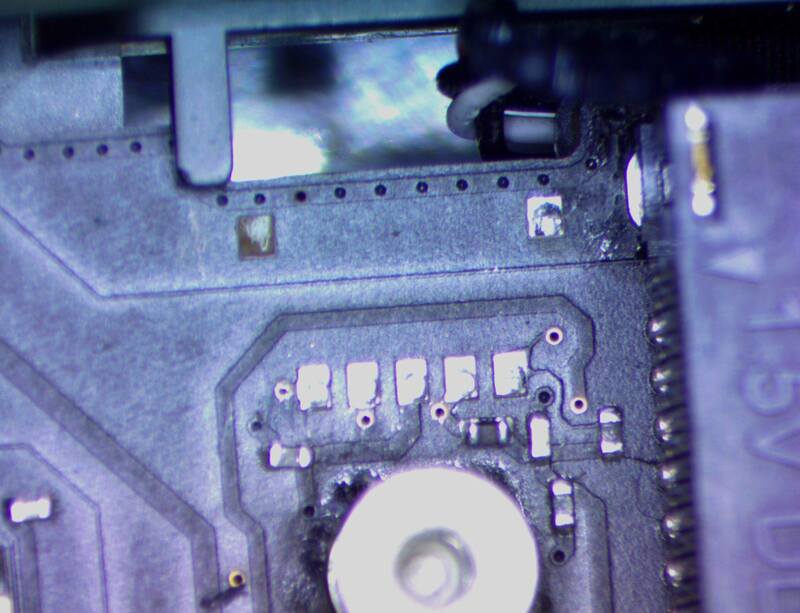 These machines were subject to a recall (same as the 2011′s) for GPU issues – however in a lot of cases it is in fact damaged soldered connections to the GPU power QFN package (U8900) we suspect due to its placement on the underside of the board underneath a heatsink screw hole which applies pressure to the board and damages the connection. 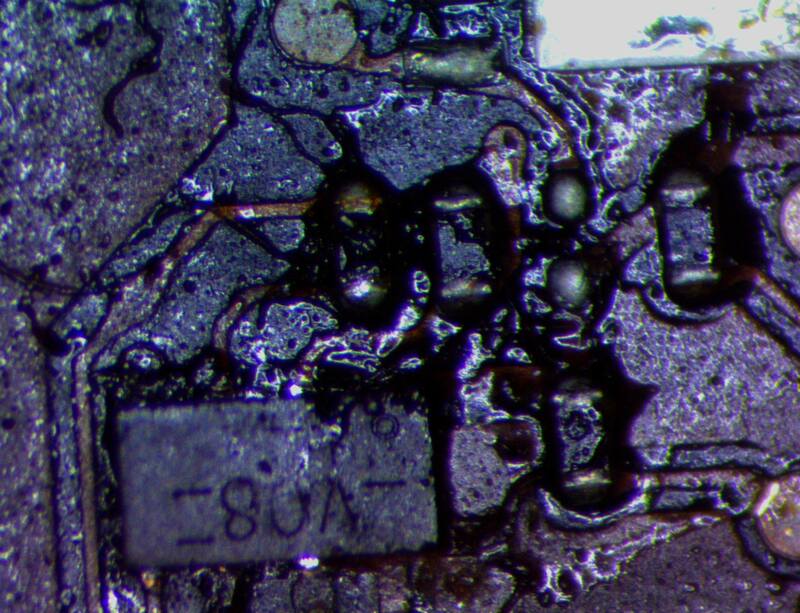 This can be resolved by preheating the board and flowing the solder to the pins of the chip. Most common symptoms of this is the screen going black or not coming on at all. (This only applies to the L2012 and E2013 15″ retinas, we can resolve issues on other machines but they have a different layout and don’t suffer this issue). Kudos to Duke Fawks for the solution. 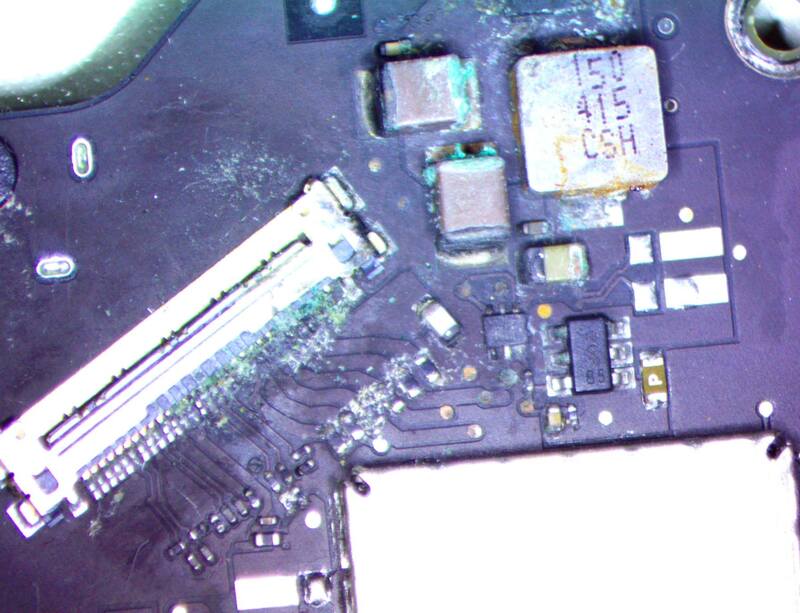 A common failing component when liquid has got onto MacBook Air’s is the U1950 chip. This is mostly used to send a all system power good signal through for the machine to turn to an S0 state (power on). 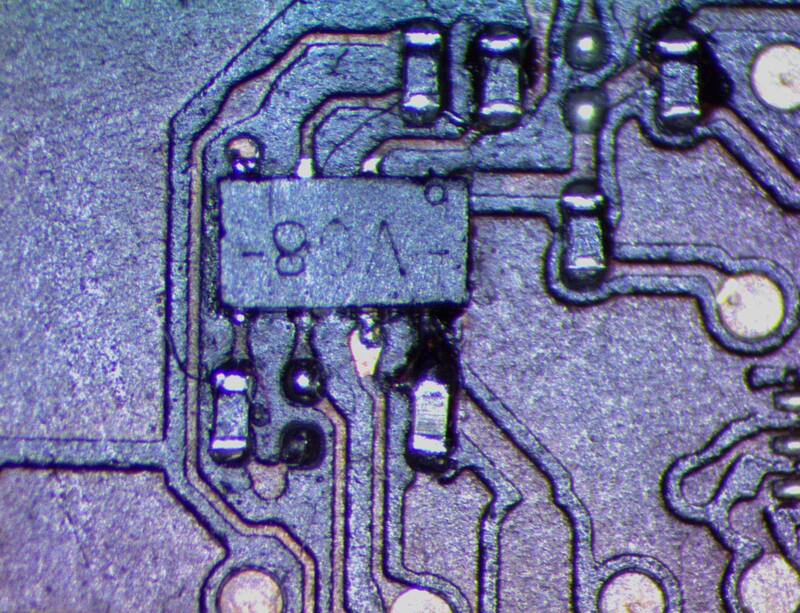 Replace the chip with a known good one and make good the traces (often pin 8 is burned). We see a lot of these where accidents have happened whilst doing a DIY upgrade or repair. In most cases these can be fixed easily. 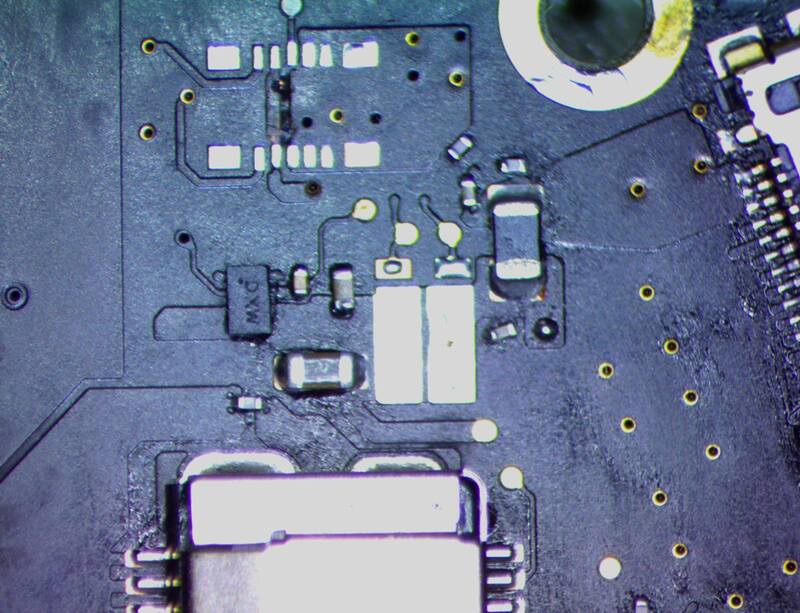 MacBook Air LVDS (display signal) connector. Our standard logic board repair service is £150 + vat. Details here. Help i’ve spilled liquid on my mac!! So we received a couple of Mac Pro 1,1′s which were having issues and decided to see what we could make from them. The idea being to make a powerful, modern Mac as cheaply as possible. The Mac Pro 1,1 is a great place to start – it has masses of internal expansion, and can be grabbed cheaply second hand sources, often for less than £ 100. The basic issue with the Mac Pro 1,1 is that as factory setup and running it will not run above Mac OS 10.7.5 – this limits it’s usability; especially with Applications like Adobe CC or even modern apps like Photos or iTunes. It also limits some upgrade options; especially with Graphics cards like our R9 – as these earlier OSes do not have the drivers needed. To start with much of this work has been done by others; I will try and link back to sources as much as possible. That said many people have done similar things in different ways – so I will try and justify my methodology as well (or at least explain the logic behind the decision). 2) Upgrade the CPUs to 2 x Quad Core 3.0Ghz Xeons. 4) Install 4 x HDDs (defiantly Matched in size – preferably matched in brand, model etc) – Setup as a RAID 0 – and Test. 5) Upgrade the Graphics Card (we used our R9) – you need to have at least 512 MB VRAM. So these steps in detail – with reasons and processes. There is a useful forum here: which has a utility to do this. I followed the instructions and rebooted with the long tone and off you trot! This is needed to add support for the newer CPUs we had in store. We had these in store from a failed Mac Pro 2,1 which had logic issues – but they can be purchased from eBay very cheaply – there is a great list here on MacRumors which can help you decide which suit your budget / needs. If you want to run lots at any one time then going from Dual Core to Quad Core can be helpful (I wanted to get virtualization working to support legacy OSes at the same time) – otherwise going for higher clock speed is more helpful for processes such as video encoding. If you trust the second hand market; you can pick up some real bargains for 667mhz RAM for these Machines (we do see some customers with issues from second hand RAM but would image it is a small number given how much it appears on eBay etc) – we do sell new modules here. You MUST have above 12 GB RAM to run El Capitan without it falling over at random intervals – when we had it up and running with 8GB (waiting for a stock delivery) it would fall over every 10 mins or so at random times – since the upgrade it is up for days without any bother. I had 4 x 3TB HDDs from a previous project which were no longer being used – a bit of a miss match of brands (a pair of Seagate 3TB, and a pair of WD Green 3TB drives). Once these were installed in the Mac Pro I used Target Disk mode via Firewire to a Mac Mini and setup as a RAID 0 using SoftRAID. Using target mode meant that we could install the latest SoftRAID drivers and not have issues later with older versions etc. This RAID gives over 500MB/s read and write speed (as tested with BlackMagic Disk Speed Test) – and you could expect more with newer and matched drives. Not bad for 12TB of storage! I used RAID 0 as this Mac will be backed up to a Time Machine server and also be acting as a Media Backup – so failure accounted for. 5) Upgrade the Graphics Card (I used our R9) – you need to have at least 512 MB VRAM. Video Cards with less than 512 MB VRAM cause issues on these early Mac Pros with the later OSes. I replaced the stock GT with a flashed R9 270x 2GB VRAM. Other cards will work; however the 270x is within the Max power draw spec, has nice out of the box driver support in 10.11.6 and full Dual-link DVI. I used the Mac Pro in Target disk mode attached to a 2012 Mac Mini running 10.9 – this allowed me to install 10.11.3, create an account and complete all the usual upgrades to 10.11.6 so that I knew it was a fully working install. – Effectively using the Mac Pro as a big hard drive enclosure! This involved replacing the boot.efi and adding a line item to the <supported devices> plist. (I went for grey as I am a traditionalist!). A tentative reboot with the “Alt” key and the 10.11.6 RAID appeared – selected and then the login appeared! It lives! Make sure that the hard drive is selected in the startup disk panel to avoid a long delay on boot and it has been up and running ever since! So now I have a Mac Pro, running El Capitan 10.11.6 with 32GB RAM, 12TB hard drive operating at similar speeds to a modern SSD, the wonderful R9 270X with 2GB VRAM and two displays. Daily it runs four web browsers with approx 10 tabs in each, Parallels with various older OSes from 10.6.8 server upwards, Photos, eMail, Facetime (with a USB webcam), iTunes, iWork and all the usual office tasks and all for less than the cost of a iPad! So Apple have released several versions public betas for the next version of macOS – Sierra (10.12). With this release, the first since mountain lion 10.8, Apple have introduced new limits to the hardware capable of running it meaning that most Macs made before 2010 will not run it. So; what does this mean for owners of these “orphaned” Macs? Not much really – we are starting to see some older versions of the OS’s loose support for modern browsers (10.6 and 10.7) especially some popular sites like iPlayer, Netflix, facebook and twitter (and strangely often reported thetrainline.com). Even Chrome which has valiantly keep supporting older versions of Mac OS X has stopped supporting below 10.8 with new updates. This means that now is the best time to get your older Mac up to date, and leave it running “as is” to give it the best chance of still being usable in years to come. Here is a quick list of must dos to make this happen. 1) “Get” Mac OS X 10.11 (El Capitain) from the Mac App Store – with previous releases as soon as the newest is out you can no longer purchase the last one so make sure it is on your Apple ID before it goes (once it is gone you can always re-download from the “purchased tab”). 2) Check how much RAM you have – we recommend at least 6GB to run El Capitain. 3) Make sure you have a working backup. Upgrading the OS should not cause any issues, but if you don’t have a backup and something does go wrong you could loose all your data. – see our Tips and tricks for a Major OS Upgrade for some details on this. 4) Check your hard drive before upgrading. – We recommend two applications which can test your have drive: It is worth running these before upgrading the OS. i) BlackMagic Disk Speed Test: this tests the speed of your hard drive for use with digital video – very useful as failing hard drives often slow down. Expect a normal working HDD to give 70-100 MB/s – failing hard drives between 10-30 MB/s. If these readings have a high range (i.e. 1st is 90MB/s and then 30MB/s) that can also be a issue. ii) SoftRAID: This is a great tool for creating an array of disks into a volume for speed or data redundancy. It also reads the extended SMART info which can be a helpful indicator of a failing hard drive. 5) Make sure you have enough time to be without your Mac – if something goes wrong it may take a few days to get back up from your backup or replace failed hardware – not worth doing if you have a major project due in next week! In summary; now is the time to get these 2008-2010 Macs up to date and current to make sure that they are still useful machines for years to come. Today we were asked an interesting question: A customer was given a 2009 Mac Pro as a work Mac and told he could do whatever upgrades he wanted as long as the performance was improved; up to £1500. What would you do? This sparked some serious debate in the office; mainly about the order which these upgrades would be installed to give the maximum kick for the buck and completing piecemeal as budget allowed. Below is what we agreed and the order we would do it in to give the quickest improvement first. i) Install a very very fast SSD for the Operating System (Mac OS X) and applications. Two options stand out – depending on need for speed and capacity. The new Tempo SSD (which is a M.2 based Blade solution attaching via PCIe) which is only available in 512 GB at the mo – more than enough for the OS, Apps and some swap files. This is the fastest drive you can attach to this Mac Pro – although it is not cheap (£ 720 inc VAT) it will give workflow changing speed boosts (approx 20 x the speed of a rotational hard drive)! Alternativly there is the 960 GB OWC Accelsior E2 These give a larger capacity, and are still around 10 x the speed of a rotational drive they are not slow! Nearly 1 TB of capacity gives this card a edge over the Tempo – but the reduced speed makes it the second choice. Also not cheap at nearly £ 640 inc VAT but a great card to breath new life into a 8 year old Mac Pro. This was the most agreed upon option in the office. The bespoke R9 270x graphics card which we have been selling for a couple of months gives amazing performance for most uses. For £ 300 inc this is a great performance improvement. The only disadvantage is that this card is not CUDA certified – meaning that specific Adobe Apps will not take advantage – Mainly After effects. This is a great speed boost for the whole OS and most Apps – giving 5-10 x the speed of the stock GT 120 and 2-4 x the speed of the best card available for the 09 Mac Pro (the 5770). iii) Max out the RAM. Conclusion: The 08-10 Mac Pros are still great computers – the Xeon CPUs can still handle all but the most bleeding edge of tasks and for around £ 1200 you can put in an amazingly fast SSD, Fast GPU Upgrade and 16GB RAM, making a really fast Mac Pro for any professional work! As above but add 4 x 2TB Hard drives into the Main bays and use Disk utility to give you a RAID 0 disk array – 8TB of fast hard drives space available. or if you really need the space you can add 4 x 4TB to give 16TB of available space. – maybe go for the smaller Accelsior to keep within budget. 1) Check your DNS settings. DNS is the system the internet uses to translate the nice human address “www.macupgrades.co.uk” into an address which the network can understand to access resources on the server. On the Mac a slow DNS server can be seen most commonly as a long delay between entering a web address and the page starting to load (you can tell a page starting to load because the name of the window will change to the proper name given by the website). This may also show itself as a delay between clicking a link and the page changing. Often your DNS settings are set by your home router; and modern routers include a DNS caching server which stores the commonly used addresses before asking the local network for the answer but as home networks get busier it can be worth adding a secondary DNS server. One way to find your quickest server is to use this utility from google. It is also worth taking a look at Open DNS who provide a free to use service for home users. Many websites these days use advertising around their content to make back the costs of running their site. Some even treat this a business model to make their money – sometimes known as “clickbait” where the whole point of the content is to generate page views. We have all seen articles like “20 cutest cats” or “15 silly things to do with a lawnmower”. Although this may be a legitimate way to market information you might be interested in (there is a whole other debate about the use of such marketing info to categorise your lifestyle and preferences), it most defiantly slows down page loading times and is noticeable on older Macs as it increases the resources needed to display the page. Two programs we recommend are Adblock and Ghostery both available as Safari, Firefox or Chrome extensions. Installing these apps will mean that your pages will use less RAM and CPU cycles – as one customer put it the other day “making the internet usable again”. 3) Remove any “Adware” or PUAs/PUPs – Potentially Unwanted Applications or Programs. A more nefarious trend of late is adding PUPs into installer packages. We have had customers reporting downloads for TV Channels, free movie sites or from torrent sites including these. Often a PUP will change the default search engine as well as inserting additional DNS servers or proxys into your configuration meaning your internet traffic gets re-directed from where you want to go. Examples include Genio and GoldenBoy. There also appears to be some reports of “MacKeeper” doing the same thing. These can be difficult to remove; they place Safari extensions and system extensions all over the place. There is a great Application called Adware Medic which can search your hard drive for examples and removed them to the trash. If issues still exist we recommend seeking the advice of someone who can help you (such as ourselves!).. These are 3 tips which may help you upgrade your Mac online experience. We hope you find them useful. One of the services we offer is called a “reflow” – it involves heating the logic board – and more specifically the Graphics Processor of a Mac to near to the melting point of the solder used to attach these together. This has been very successful in resurrecting dead Macbook Pro’s and dead iMacs; especially with graphics artefacts in the kernel panic or in use. We have recently been trialling the same process with the Macbook Pro 15″ & 17″ 2010 and 2011. These seem to suffer similar issues (dark screen after boot, graphics issues, only booting into recovery mode or only booting in “safe boot” mode – the later two we think is because these do not use the same GPU drivers!). We have now got a modified “cookbook” for these Macs and feel we can offer this repair with some certainty. It is offered at the same price as previous re-flows (£85 + VAT) and we have had a number of happy customers of this service. Give us a call and see if we can help you out today. One of the questions we get asked often is “Do I need more RAM”. RAM is working memory which allows very fast file access but costs much much more than conventional hard drives – it has the disadvantage that it does not keep data when it is powered off but the speed means that you can load programs into it quickly to be used as needed. In a “money is no issue” world – all your applications and working data would be run off RAM and a hard disk would only be used for archiving and long term storage (i.e. when your RAM is powered off) – this is a decision made many decades ago to keep the price of computers as low as possible. Snow leopard (10.6) requires 1GB RAM Min. Lion (10.7), Mountain Lion (10.8), Mavericks (10.9) and Yosemite (10.10) all require a min 2GB of RAM. This is the lowest value you can have in order to install these Operating Systems. If you are running an older machine with a new operating system we recommend fitting as much ram as your machine can take. Once you have a number of Safari windows open, Mail and a text editor of choice you start to use up this space very quickly and notice your Mac start to slow down and get the spinning beach ball. A way to tell if this is what is impacting your performance is a tool called “Activity Monitor”. This is installed as default under each of these OS’s and is located inside your “Utilities” folder – which sits inside your Applications folder. A nice way to get there is the “go” menu which has a “Utilities” option or press”Shift-Cmd-U” when in Finder. Activity Monitor under 10.6.8 In this example under 10.6.8 you can see that 262.8 MB of RAM is in a Wired (permanently being used) state. 2.06 GB of RAM is Active – or being used but could be pulled on if really needed. 1.16 GB of RAM is inactive – this is RAM which has been used and is still allocated to it’s Applications but can become free for other uses as needed and 537.4 MB is free. It is always best to look at these stats whilst you are using your Mac – that way it shows what is going on! Activity Monitor under 10.10 So under 10.10 (and 10.9) you have a different view. Memory is used in a much more dynamic way under these later OS’s – lots of special compression and sharing which makes the picture a little more complex. The OS also “Uses” all the RAM as it can and allocates it as it chooses. In this pic we can see the memory pressure is Orange – this means that RAM is starting to have an impact on the way this Mac is operating. This has a “traffic light” scheme – green is all OK, Orange is middle and Red is causing the Mac to slow down. More RAM is good, if you need it! Using activity monitor you can see if RAM is causing your Mac to slow down and using our site you can see how much RAM you can fit and how much it will be!